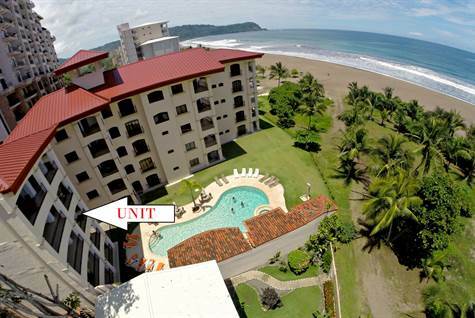 "High End Appliances, Finishes, and Furnishings"
Bedrooms: 3 "Ocean View from master"
Year Built: 2007 "3rd Floor Unit"
This luxurious Jaco Beachfront 3 bedroom condominium features some of the best unobstructed ocean and sunset views in the Central Pacific, Costa Rica area! From the comfort and luxury of your balconies, living room , and master bedroom, enjoy all the different moods of the glorious Pacific. Watch the waves, sunsets, moonscapes and starry nights, as well as Scarlet Macaws heading north every day at dusk. This is a third floor condo located in a luxury boutique development of only 30 condominium units at Jaco's pristine and serene North Beach. The brand new 55 million dollar Croc's Casino Resort is located right next to this development adding an element of appreciation, activity and luxury to this part of Jaco. Condo is in excellent condition, with custom made granite counter-tops throughout, including a beautiful back-splash feature in the spacious kitchen area. All appliances are stainless steel, and all furnishings are high-end, custom made of Costa Rica hardwoods, from the town of Sarchi, (furniture artisan capital of Costa Rica). Fully furnished and equipped, turn-key and can be occupied immediately, you and your guests will enjoy the flat screen TV's, cable, Wi-Fi, top of the line mattresses and bedding, cutlery and dishware, and gorgeous high-end teak patio furniture. Common areas include a pristine lawn leading up to a salt water pool (no chlorine or abrasive chemicals used), deck, patio, swim up bar, and stairwell areas are finished in rare coral stone (coralline), imported from quarries in the Dominican Republic. There is 24 hour security, on site parking and property management. Owner financing may be available to qualified buyers. Jaco is located one hour and 45 minutes drive from the international airport in San Jose. Shuttle service is available to this condominium. Please call or write for more information on this beautiful new listing.